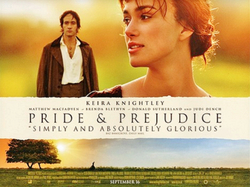 This essay aims to provide a close analysis of the representations of the sub-plot concerning Lydia and Wickham from Jane Austen’s Pride and Prejudice in two film adaptations of the novel (i). These two films will be the 2005 film Pride & Prejudice by director Joe Wright and director Gurinder Chadha’s 2004 Bride & Prejudice. Throughout, comparisons and investigations into the adaptive relationship to the original will be made and the terminology used in this endeavour will be taken from Deborah Cartmell et.al. and Julie Sanders (ii). Seeing as the analysis of the representations of the sub-plot in these two adaptations would be highly deficient without a similar one of characters and characterisation, such will also be provided. Mise-en-scène will only be treated indirectly and when relevant. Jane Austen’s hypotext sports a number of sub-plots all of which can be labelled based on their protagonists. The primary plot, of course, concerns Elizabeth Bennet’s relationship with Mr. Darcy, while a number of sub-plots, like the Elizabeth-Collins sub-plot or the Jane-Bingley sub-plot work in conjunction with the primary plot. However, due to this interconnectivity, there are some challenges concerned with considering sub-plot as distinct from primary plot or indeed other sub-plots. This essay will consider the sub-plot where Lydia and Wickham elope and are made to marry with relevant instances of foreshadow and indications of the affair. It must, however, at times refer to the Darcy-Wickham sub-plot since this is defining the Wickham character in hypo- and hypertext. Furthermore, while elements of the sub-plot affect the primary plot, so do elements from the primary plot affect the sub-plot. When Darcy exposes Wickham for a scoundrel, he lays the foundation for the Lydia-Wickham sub-plot while this in return gives Darcy an opportunity to show his virtue. Finally, it is worth noting how the sub-plots serve a purpose in relation to the primary plot. In many cases, the protagonists of sub-plots function as foils to those if the primary plot emphasising different qualities in these. The sub-plot in question is certain to appear in adaptations, because the relationship between Elizabeth and Darcy is explained in contrast to the relationship between Lydia and Wickham through the way these relationships engage with each other. Chadha’s film Bride & Prejudice is a complex adaptation of Austen’s hypotext influenced by both Bollywood and Hollywood cinema. It is set primarily in modern India, but also in England and the US. It follows the plot of the original closely, centring on the adapted Bennet family, the Bakshi, and their quest for acceptable marriages for the Bakshi daughters. Like Chadha’s 2002 film Bend it like Beckham, it enters into a complex social discourse addressing issues such as multiculturalism post-colonialism and globalisation. It also comments on heritage cinema versions of the hypotext with its own brand of national cinema (iii). It thus closely engages with its literary hypotext in a variety of ways. This chapter will study the representation of the Lydia-Wickham sub-plot in Chadha’s adaptation, here identifiable as the Lakhi-Wickham sub-plot. Like the hypotext, the film contains a number of sub-plots amongst which the Lakhi-Wickham sub-plot figures. The adaptation of a plot from literature into the film medium often entails a shortening of both the plot itself and the reduction and sometimes omission of subplots. This is because directors would find that the timeframe available is unable to cater for all the plot elements present in the hypotext. In Bride & Prejudice, the Lydia-Wickham sub-plot is maintained but relegated further to the margins and somehow altered in order to suit the medium. All the basic constituents of the sub-plot are present; the exposition of characters, the elopement and the resolution but much of what is represented through the spoken and written dialogue and internal monologue of other characters in the hypotext is substituted for brief visual or significant spoken representations in the hypertext. Thus, the exposition of the characters, the signifiers of their romantic involvement and the resolution are shown rather than told (iv). This technique condenses the sub-plot and allows the primary plot to fit within the timeframe of the film. The film also alters the original sub-plot somewhat. It includes a growing affair between Lakhi and Wickham. This might be a necessary addition in order to explain the transition of Wickham’s affections from Lalita, the adapted Elizabeth, to Lakhi or a commentary on the lack of such in the hypotext, where the elopement appears suddenly. Furthermore, the resolution appears on a level which is visually more available to the audience than a more “faithful” representation of the equivalent in the hypotext would indicate (v). In the film, the adapted Darcy and Lalita tracks down Wickham and where he in Austen’s novel is made to marry Lydia, he loses a fistfight against Darcy in the film and Lakhi recognises her folly as opposed to Lydia. This is an approximation of the resolution to a modern setting and a modern audience where the crucial involvement of Darcy is retained. Finally, the fundamental conflict in Lydia and Wickham’s elopement, the romantic union outside cultural norms, is maintained although not as explicitly as in the hypotext because this would require more playtime. The extra flaw, Wickham’s moral deficiencies and his earlier elopement with Georgiana Darcy, was in Austen’s novel introduced well before his elopement with Lydia. In the film, however, these faults had to be altered. They had to be introduced closer to the actual elopement in order to keep the suspense of the plot and within the time frame of the film. Also, more of the faults from the hypotext had to be approximated, despite time concerns, in order to make the unsuitability of the union apparent to a modern, Western audience who unlike a more traditional Bollywood audience would not necessarily consider the union immoral. After the elopement has taken place, Darcy reveals that Wickham had earlier made his sister pregnant at the age of 16 as compared to them having an affair when she was 15 (vi). In this manner, Chadha approximates the conflict and restructures the plot in order to accommodate modern, Western sensibilities and the altered medium, but it is worth noting that the significance of the Darcy-Wickham sub-plot is maintained as crucially intertwined with that of the Lydia-Wickham sub-plot. Seeing as the sub-plot is defined by character, a brief introduction to characters and characterisation is in order. The hypertext has received the Austen characters in a new cultural context. There is, in general, a one-to-one relationship between the received and the original characters (although a few minor characters are left out and Mary and Kitty are combined into the comparatively flat character of Maya). Lydia, then, becomes the flirtatious and socially naïve Lakhi while George Wickham becomes Johnny Wickham. Nomenclature does, in other words, play a role in presenting adaptive fidelity to the hypotext. Furthermore, as evidenced by the Wickham character, the characters are approximated for a modern audience and a modern setting in terms of names. This does not merely concern names, as Wickham’s defining vocational characteristic, being a soldier, is received in the new setting as a backpacking and seemingly unemployed Casanova, his social weight retained in contrast to the adapted Darcy’s position as a corporate executive. This change is made because a soldier would not hold the same attractions for Lakhi in the hypertext as he would for Lydia in the hypotext. Finally, it is worth noting that the relationship between Lakhi and Wickham appears in the film as noticeably secondary to that between Lalita and Wickham. This can be seen as a result of the limitations of the medium, for because of the limitations in play time, Wickham’s role in relation to Lalita and Darcy needs to be visualised more directly and succinctly than in the sub-plot in question here. Without a clear narrative voice, the Bride & Prejudice characterisation diverges from that of the original novel. Whereas the novel’s point of view catered for the direct comments of a third person omniscient narrator in addition to the characterisations afforded by written and spoken dialogue, the hypertext has to represent the protagonists of the sub-plot through different means. While the rest of the film makes widespread use of a characteristic Bollywood feature, diegetic songs and item numbers, for characterisation, Lakhi and Wickham is primarily characterised through action as well as apparel, being in the margins of the primary plot. Wright’s Pride & Prejudice, launched in 2005, ten years after Andrew Davies’ iconic fusion adaptation for television, is an adaptation for a new target audience. It is set in 1797 when First Impressions, the first version of Austen’s 1813 hypotext, was published. It thus distances itself from earlier adaptations, all centred on the latter version, whose formality would alienate the younger target audience intended for this film. This approximation entails some degree of rejection of the Laura Ashley school of filmmaking, “chocolate box England” and heritage aspects of earlier adaptations and incorporates Hollywood-style elements, which would appeal more to a younger audience (vii). This, coupled with the change of medium discussed above, affects all levels of the film, including the sub-plot of Lydia and Wickham. The first foreshadowing of an affair, and a platonic one at that, is given immediately after the introduction of the Wickham character (viii). After initially having made Lydia and Kitty’s acquaintance, he joins them in shopping for ribbons. In offering to pay for Lydia’s ribbon, he strokes her cheek and produces a formerly palmed coin from behind her ear. This is a signifier of physicality with connotations to prostitution and the gesture has no ready equivalent at that point in the hypotext plot (ix). However, where the book indicates the platonic aspects of the relationship in the possibility of Lydia’s coming “upon the town” or being “secluded from the world, in some distant farm house”, i.e. prostitution or giving birth in hiding, this very visual representation approximates that aspect for a younger, more modern audience (x). The film’s representation of the sub-plot goes on to follow the hypotext relatively close. As opposed to the Chadha adaptation, this adaptation allots the appropriate amount of play time needed to make the Lydia-Wickham sub-plot a considerable factor in the primary plot. On the commentary track, Wright recognised that once Elizabeth and Darcy had been brought together at Pemberley, taking centre stage in earnest, the sub-plot had to be made appropriately prominent to appear relevant (xi). Its relevance, as mentioned in introduction, stems from its comparative role, allowing for Darcy’s consolidation of his virtue, morality and place in Elizabeth’s heart. The Lydia-Wickham sub-plot works further here to define both Lydia and Wickham as negative foils outside the primary plot protagonists’ subjective spheres. This means that all the major elements of the hypotext sub-plot, the conflict; the news of the elopement, the resolution; the marriage settlement and even the, from a narrative point of view, consolidating stay at Longbourn can be found in the film. The points of divergence from the hypotext, then, appear only in a number of smaller instances and do not constitute a decisive rewrite of the original sub-plot. As often as not these divergences can be explained by the above mentioned factors of medium and audience. The news of the elopement is brought by letter, as in the hypotext (xii). However, the corresponding scene not only includes both the Gardiners in addition to Elizabeth but also Mr. Darcy (xiii). This was probably done to limit the play time whilst still incorporating the protagonists of the primary plot, establishing the above mentioned function of the unravelling sub-plot for viewers. Elizabeth’s comical circling of the wall might be a ploy to appeal to those younger viewers unaware of the implications or unimpressed by the social magnitude of such an elopement. Furthermore, Mr. Bennet does not show the same feelings of guilt in Lydia’s fate as he does in the hypotext (xiv). In the novel, Bennet comments on his guilt in between correspondence by letters with Mr. Gardiner and Mr. Collins. The omission of all this is a part of a larger process of limiting the narrative to the essentials and even commenting on the sheer amount of correspondence in the interval between the rise of the conflict and the resolution. Also, in terms of narrative levels, the added dimension of Bennet’s feelings would complicate the levels above, i.e. the sub-plot and the primary plot, and confuse younger viewers. Therefore, the film contents itself with visual representations of exasperation which can easily be neglected or missed without much consequence for the sub-plot. The only indication of Bennet’s regret in his method of raising his daughters is given when he in the film, like in the book, becomes stricter with Kitty as a result of the Lydia-Wickham sub-plot. When the Wickhams arrive for their stay at Longbourn, Lydia reveals Darcy’s role in the resolution with considerably less candour in the hyper- than in the hypotext. In a scene which in many ways shares some characteristics with the elopement letter scene in terms of reduction of narrative space, Lydia performs the role originally assigned to Mrs. Gardiner (xv). Thus, in the interest of narrative space and flow, for the hypotext letter from Mrs. Gardiner would certainly disrupt the dinner scene, the same agenda for simplification is pursued for much the same reasons as above. The last alteration in the representation of the sub-plot to be found consists of an added element. Apart from the presence of the soldiers, whose belligerent vocation is toned down in favour of appearance, Austen’s novels have little room for physical violence, and yet the adaptation hints at such. When the Wickhams are leaving, the novel only remarks Wickham’s vivacity compared to Lydia, but the film clearly shows him violently pushing Lydia down into the seat of the carriage (xvi). This could both emphasise the artificiality of the affair and hint at future domestic abuse. The use of violence, if noticed by viewers, would provide a commentary on the absence of such in the hypotext and to some extent anchor the sub-plot in a social context. In terms of characters and characterisation, much remain similar to the hypotext and the deviations can largely be explained by the introduction to this chapter. The social status of each character is reflected in his or her attire and surroundings. Despite the rejection of revealing Laura Ashley style dresses, a certain physicality to the characters is maintained by the inclusion of dressing scenes, untidy hair and more physical contact than what the hypotext sanctions. The already mentioned foreshadowing of the affair as well as Lydia’s physical display of affection; touching and dancing about, could serve as examples in addition to the above extension of the sub-plot. This approximation of characters and the visual characterisation is mirrored by the characterisation through auditory communication. Though the use of letters, so prominent in the hypotext, is maintained to some extent in the hypertext, the narrative would suffer both in space and flow without the substitution of some letters for dialogue. One effect of this is that characters appear more outspoken. Lydia’s verbal narration of her affair at Longbourn gives her an air of lacking in sensibility which excels that given by the letter in the novel (xvii). Another effect is that in order to maintain the level of intimacy the letter offers, the mise-en-scène would have to create the atmosphere of intimacy a letter has, which would be a natural transition for an adaption into a visual medium. A further signifier of intimacy could be the use of language, body language and posture which is used extensively for purposes of characterisation in the adaptation. In contrast with earlier adaptations and the hypotext, the characters use modern polite language diverging from the original dialogue, modern body language like slouching or expressive airs and looks. The language, attitudes and facial expressions of Lydia in the final scene at Longbourn and her and Elisabeth’s surreptitious play with the glass of wine are both aspects of a visual form of narration and an approximation to a younger audience (xviii). This element in the representation of sub-plot thus mirrors the overarching agenda for the entire sub-plot as well as the adaptation in its entirety; to update Austen’s novel for a new audience, both in terms of form and medium. Both these film adaptations can be seen as approximations and commentaries on the hypotext and the representation of the Lydia-Wickham sub-plot mirrors this. The Chadha hypertext performs a cultural transposition as well as a modernising approximation and receives the sub-plot in a more visual medium. This process allows for commentary, most prominently a post-colonial one, i.e. in terms of the cultural background of the protagonists and their encounters with cultural settings closer to the hypotext. In the Wright adaptation, the sub-plot is more faithful to the hypotext. It is more prominent and disconnected from Elizabeth’s person in than in Chadha’s adaptation, the resolution is similar but closer to that of Austen and the elopement is not shown as it is in Bride & Prejudice. Thus, the divergences in Wright’s film are less apparent but, as seen above, do serve a purpose. What is shared by the sub-plot representation in both adaptations are media-specific characteristics, a recognition of a new target audience and the realisation that the sub-plot serves as the primary channel through which the Lydia and Wickham character show their significance for the primary plot. While the two former are shown in the formal and social aspects of the film, the latter is shown by mere inclusion. In terms of narrative, the sub-plot could easily have been left out with a few adjustments to the primary plot, but this would have left the primary plot deficient because of the Lydia-Wickham sub-plot’s relevance for the primary plot and its protagonists in terms of characterisation and plot progress. (iv) See examples of of the exposition of Lakhi and Wickham in Chadha 2004: (02:30-02:57) ,(28:55-33:36), of the elopement in Ibid: (01:31:20-01:31:57) and of the resolution in Ibid (01:33:20-01:36:14). Glad you liked it, and thanks for visiting the blog!